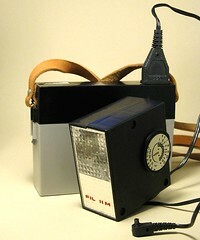 FIL (ФИЛ) electronic flashes were made by the Norma company of Tallin in Estonia (former USSR) from 1957 to 1990s. The production line included models of different size and power, from small popular models to big, handle mounted professional units. Some of them were equipped with variable power settings, but no automatic exposure control was used, nor bounce and swivel heads. 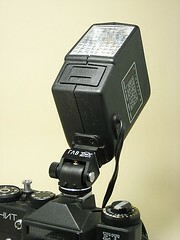 FIL flashes - with an exception of FIL-22 - were all powered by 220V mains, but majority of them were sold in sets with dedicated battery packs. 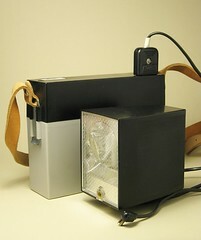 A battery pack for powering 220 V mains flashes with four D-size cells was also marketed by Norma as a separate item. 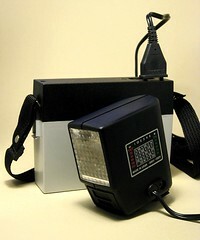 Before putting the FIL-16 flashlight unit into service, the flash needs to be connected to 220V AC mains for 10...20 minutes without making any flashes during this time. Moreover, it is recommended for forming the electrolitical capacitor, that intervals between first 5-10 flashes should be not shorter than 1 minute. ↑ This abbreviation apparently comes from Фотографическая Импульсная Лампа - Photographic Impulse Light. Бунимовч Д.З., Фомин А.В. : Справочник фотогафа [Photographer's handbook]; Легкая Индустря, Moscow, 1970. Симонов А.Г. : Фотографирование при искусственном освещении [Photographing with artificial light]; Искусство, Moscow, 1959. Flash page of G. Abramov's "Development stages of Soviet and Russian photographic industry"
This page was last edited on 10 July 2013, at 06:43.